The original Ford Model T will always hold an important place in the Company’s history by getting the Cullimore show, quite literally, on the road. But it has to be acknowledged that it would not be of very much use in today’s business climate and traffic conditions. Today the Cullimore group of companies operate a fleet of more than 80 vehicles; many of these support the more specialist functions mentioned on later pages, but the general haulage fleet of tractor units, with a variety of trailers to cater for almost any load, is based at Netherhills depot, lying between the villages of Whitminster and Frampton-on-Severn. The staff in the transport office are experts in their field and will be delighted to talk to customers old and new about any transport requirement, regardless of size or nature of load. The Transport Yard and facilities at Netherhills lie only a mile off the M5 Motorway and has great potential for future expansion from a site 23 acre site. Other businesses already operate from this site. The Company is delighted that their fleet was included among a select band of UK companies in The Classic Hauliers in 2001; they do indeed see themselves as such, maintaining the highest standards in fleet presentation and customer service. In 2001 a Cullimore Foden tipper was produced in the well respected Corgi range, but a more recent accolade in 2004 was a Corgi two-piece set of ERF’s entitled ‘A Dickensian Tale’, the last of the line from Middlewich in 2003. Cullimore’s have undertaken the painstaking restoration of two of their vehicles, a Wartime Scammell and a 19611 Foden tipper. Both have been regularly taken to The City of London for the ancient Cart Marking ceremony outside the Guildhall, which is carried out annually in July. This historic ceremony sees a select band of Carmen and Freemen of the City of London bringing their trucks, tractor units, veteran and vintage vans, some still horse-drawn, to be branded with a hot iron on a wooden plate attached to the vehicle’s body. The ceremony serves as a reminder of the centuries of service hauliers have provided to the well-being and development of the City, and maintains the Carmen’s ancient tradition of seeking the Lord Mayors approval to their plying their trade within its boundaries. The Company is eligible for inclusion through Roger Cullimore’s status as a Freeman and Carman of the City. In the Carmen year October 2004/05 Roger was Master, which included “Trafalgar Year”. The vehicle history has recently been researched and it is amazing to find that some 350 H.G.Vs have been acquired over the years, almost all bought new. Bedfords, Dodges and Commers accounted for many of the vehicles up to the 1960s, with Leylands then arriving in some quantity. It is however ERFs and Fodens which have formed the mainstay of the more recent fleet. 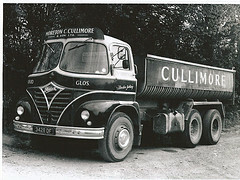 Cullimore’s has enjoyed a long and successful relationship with both of these manufacturers; they bought their first Foden in 1948, and the first ERF joined the fleet in 1967. While both manufacturers have been through various changes in ownership in recent years, this Company remains firmly in family hands. It is a sobering thought that the Model T had a payload of just 1 ton. Today’s vehicles can operate at up to 44 tonnes gross carrying 29 tonnes. The combined transport fleet covers over 2 million miles each year and Cullimore’s will be delighted to have your goods on board.